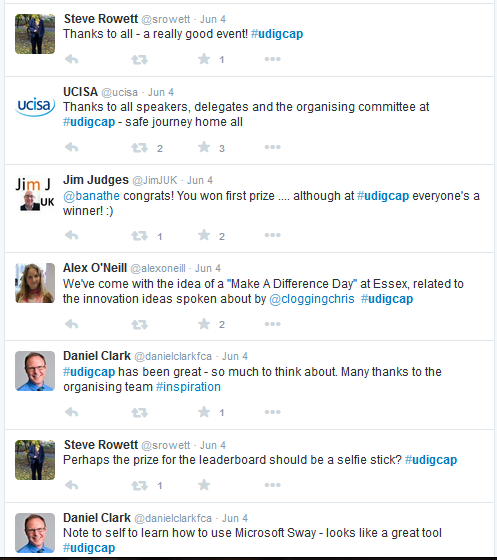 In early June I had the pleasure of implementing a conference-wide gamification activity in support of the UCISA Digital Capabilities event. The event took place at MediaCity, Salford; a vibrant and engaging venue for an event stocked-full of innovative ideas. The event focused on showcasing successful practices for supporting academic staff and learners in their use of technology within further and higher education. Another goal of the event was to highlight findings from the recent Digital Capabilities survey. So when a member of the event organising committee, Iain Cameron (University of Aberdeen, and UCISA Digital Capabilities committee), mentioned the idea of a Twitter selfie (or Twelfie) competition as part of the proceedings; Rise immediately came to my mind as the right tool for the job! I had encountered Rise before at a demo at the International Confex event in 2013 and then again during the Mahara 2014 Hui held at the University of Brighton. Rise really stoked attendee engagement via Twitter. There were around 90 tweets that included twelfies. Overall, there were almost 1200 tweets related to the event, many of which were a direct result of attendees taking part in the Leaderboard. The competition called for attendees to take photos of themselves with other attendees, speakers and celebrities. This encouraged both in-person and online engagement. 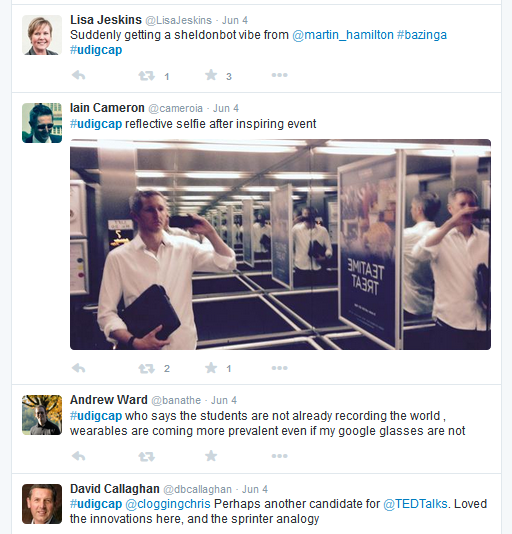 The competition boosted discursive engagement and publicised the twitter feed prior to the event. This was largely achieved by some pre-conference challenges where attendees were asked to take engaging photographs of their journey to the conference. Our photo-based metrics meant that we had to do a lot of manual scoring. I suggest using a wider variety of metrics, including a mixture of automatic metrics derived from twitter polling and manual metrics. Limit the number of times a certain metric can be scored. We found that some of the twelfies became repetitive, as there was not a limit on the number of times that a twelfie could be scored. engage in the conference treasure hunt and tweet what you found etc. Take greater advantage of the need for the human superviser, or games-master, and consider using them to lead tweet-ups of certain topics raised during the event. These could also have point-awarding options. Consider day-by-day scoring and options for remote attendees and second day attendees. Points for @mentions of anything other than the conference hashtag, can affect the quality of tweets’ written content due to the character limit. Best to keep it to one @mention metric. Add players in advance of the conference, if possible. Having clearly defined board release times was a good strategy and led to a sense of anticipation, e.g. 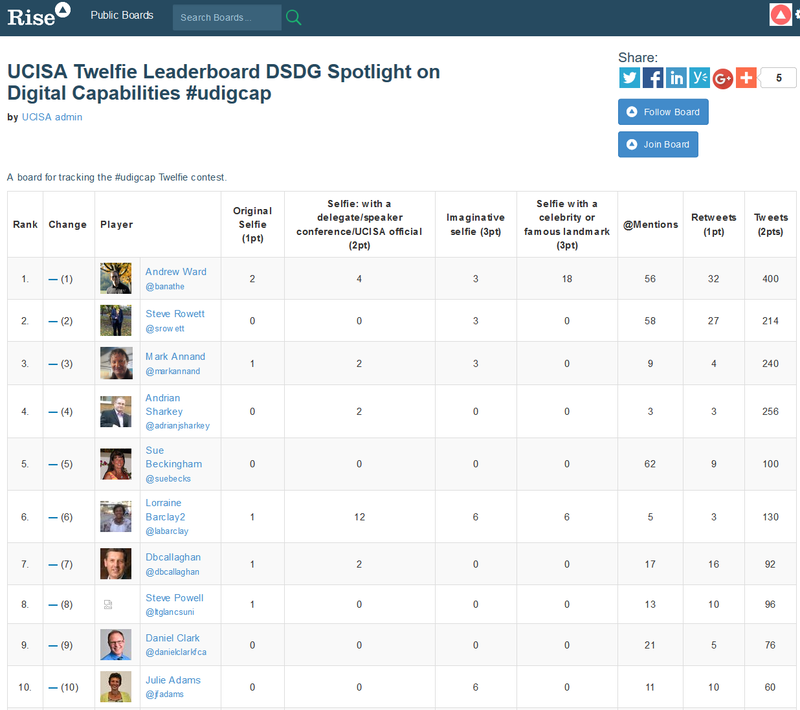 breaks worked well as times to release and show the updated leaderboard. Leave at least 10 minutes for the polls to complete and to release the board. 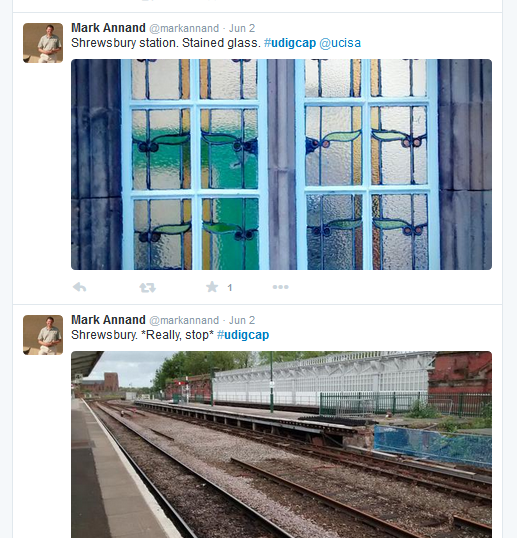 I owe this idea to Katie Piatt (University of Brighton), who used this strategy to great effect at the 2014 Mahara Hui. As I contemplate gamification at the next iteration of the Digital Capabilities event I have been considering how the competitive element could be developed further. Here are a few ideas, although I won’t go into specifics, as I don’t want to give the game away in advance! Make awards unexpected – as Daniel Pink, explains in his 2010 book, Drive expected extrinsic rewards can negatively affect performance (pp. 63-70). Therefore adding some unexpected rewards for completed tasks could add value. However these rewards will not be itemised on the rules list, so a disclaimer about judge discretion may be helpful! Reward introverts as well as extroverts – one of the best conferences that I have ever attended was Eyeo Festival based in Minneapolis, Minnesota, USA (http://eyeofestival.com). Eyeo is an awe-inspiring event focusing on data visualisation, interactivity and maker ethics. However in the midst of all the flashy stuff, in the two years that I attended they had quiet spaces where one could engage in puzzles and inventions related to the event, sans supervision or sales influence. This was an invaluable opportunity to play and learn. Having an area in a conference like this provides time for time-out and inspiration as well as hidden scoring opportunities! An idea inspired by Jane McGonigal’s book, Reality is Broken (2012): we allow attendees to +1 each other. This is like an in-person analogy of a “favorite” star or a “like” thumbs-up, but because it is real, perhaps it means even more within the context of the event. I like the idea of using physical +1s (think cardboard cutouts the size of a plate) which could become the subject of a selfie; a nice option for camera shy attendees. Finally this is an idea that I owe to Pete Jenkins (http://gamificationplus.uk), who suggested making the next iteration of our competition, a team-based activity. Rise Leaderboard can support this mode of use. The concept is that player interest will be more sustained if they are contributing to a group effort, as opposed to seeing individuals rapidly ascend up the leaderboard and losing the will to compete due to very high leading scores. In the team model points can still be awarded individually for small activities and these can contribute to the collective team score. Well, I for one am excited about the next Digital Capabilities event!